Built by French autonomous vehicle technology company, Easymile, the EZ10 shuttle is already in daily use in a number of locations around the world. It uses a range of technologies to drive and guide itself and is capable of operating on existing roadways, without any need for changes to infrastructure. "We've got a LIDAR on the roof of the unit which basically monitors about 400 metres around the vehicle so it tracks the static objects like your buildings, like your street furniture," said Neil Cunningham, Chief Executive of Civic Group which brought the vehicle into the country. "And then on each corner of the vehicle they have radars. So that looks out for bicycles, pedestrians, any object that is moving." "This works really well in airports or ports or campuses - the last mile where maybe you get off at a DART station or a bus stop and you are trying to get that journey at the end to get you home," said Jamie Cudden from Dublin City Council's Smart City programme. "So we definitely see this taking off. It is in cities and countries around the world already, so we need to think about how we cater for that future." To date the government hasn't moved to regulate for driverless vehicle testing. But experts say given the speed the sector is moving at and the concentration of technology companies in Ireland, the country should be involved in testing. "There's a lot of work to do," said Jamie Cudden. "Dublin is a complicated place to get around at the best of times." "It's more the defined use cases looking at defined routes and I think that is the first step." "And then as we look at some of the broader regulations we need to really work together across different departments with cities to figure out how we make this happen." 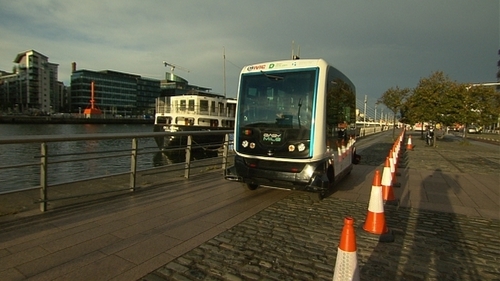 The event is part of the Future of Mobility Showcase - an initiative by Dublin City Council as part of its Smart Docklands project, to mark this year's European Mobility Week. As well as the autonomous shuttle there are also other exhibits looking at e-bikes, car clubs and e-scooters. The public can apply here for the last few remaining free tickets for tomorrow's trips, which take place between 11am and 5pm. Alongside the shuttle trips a range of other exhibits will be on display tomorrow as part of the showcase.